Agency retirees are seeing changes to their health care benefits next year. For retirees of United Methodist agencies, going to the doctor or pharmacy this year often has seemed like investing in a bear market — unpredictable and extremely costly. The General Council on Finance and Administration’s board on Aug. 22 approved changes to retirees’ plan that members hope will bring some consistency in pricing and reduce retirees’ expenses. “It’s still Medicare Advantage, but it’s a little bit more generous than what we had before,” said Valarie Willis, chair of the GCFA board’s Committee on Personnel, Policies and Practices. She is a lay member of the West Ohio Annual (regional) Conference and a consultant in leadership development. As of June, 836 agency retirees were enrolled in the Medicare Advantage plan, a supplement to traditional Medicare. The plan is insured through UnitedHealthcare. The changes take effect January 2015. Under the current plan, retirees pay a $250 deductible and then 15 percent of the cost of any medical care including hospital visits. These rules, in some cases, have meant unexpected bills for hundreds of dollars, if not more. While United Methodist general agencies can rely on the benefit trust for the time being, paying for retiree health benefits remains a challenge for churches and businesses across the United States. Dale Jones, managing director of education and plan sponsor relations for the United Methodist Board of Pension and Health Benefits, noted some of the challenges in a presentation to GCFA. “If you had asked me 10 years ago… I would have said the way things are going, retiree health insurance looks like it is going to eat up church finances,” he said. That hasn’t happened because many U.S. conferences have moved toward eliminating or phasing out group benefits for retirees, Jones said. More than 20 conferences, he said, have replaced their group plans with a health reimbursement account or stipend for retired clergy members to use to buy their own insurance. There are 57 conferences in the United States. “As a result what we see is total retiree health liability is not greater today and maybe even a little less than it would have been 10 years ago,” he said. “I don’t know about you, but I have yet to see a menu at the doctor’s office telling me what they are going to charge,” Willis told the board. Also under the current plan, retirees pay 25 percent of the cost for certain specialty medications. That percentage can easily end up costing retirees thousands of dollars. Jackie A. Jones of Mercer, an insurance consultant working with the general agencies, gave the example of Copaxone, which treats multiple sclerosis and costs $4,600 for a month’s prescription. So, for that medicine, the cost to patients is around $1,150 per month. Co-pays of $10 for primary care, $20 for a specialist, $35 for urgent care and $500 for hospital admission. No more than $95 for “Tier 4” specialty drugs, and co-pays of $10-40 for other medications. An annual out-of-pocket maximum of $1,500 for medical care. 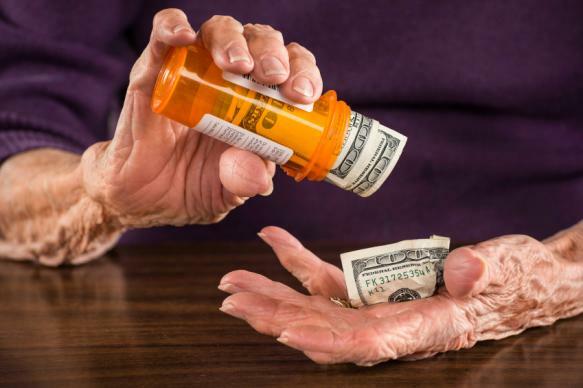 Once total drug costs reach $4,700, the retiree will owe co-pays of $2.65 copayment for generics or $6.60 for all other drugs. Total drug costs include both what the retiree pays and the plan pays. Next year, retirees’ contributions to their monthly premium for the Medicare Advantage plan will go up from 15 percent to 20 percent for an individual retiree. A retiree with one or more dependent contributes 25 percent, and that won’t change. The total premium will be $245.57 for a retiree, and $491.14 for a retiree with one dependent. That means a single retiree will pay $49.11 a month, and a retiree with one dependent will pay $110.51 a month. Willis said she and other committee members heard from retirees that they would be willing to pay a slightly higher premium rate for more predictable costs. David H. Howard, an associate professor in Emory University’s Department of Health Policy and Management in Atlanta, said the erosion of employer-provided retirement benefits is a long-term trend across the United States. One reason is that it is now more expensive to provide health insurance for retirees because of rising health care costs and increased longevity. In addition, he said, unions historically prioritized retiree benefits, but union membership has been declining. Another driver of the trend is a 1993 accounting rule, which required employers to subtract from their profits the future costs of providing benefits to retirees. The preceding year, dozens of large U.S. companies decided to halt providing health benefits for retirees or abandon plans to cover future ones ahead of the rule. Howard said he expects the Affordable Care Act will accelerate the erosion of retiree benefits in part because retirees without employer-sponsored insurance now have more options for finding coverage. Also the new health law funds its expansions in coverage partly by reducing payments to Medicare Advantage plans. “Some plans have responded by eliminating non-mandated benefits or increasing cost-sharing requirements for enrollees,” Howard said. With the changes, the annual cost for retiree benefits for agencies will increase from nearly $1.6 million in 2014 to more than $1.9 million next year. As required by General Conference, 6 percent of the trust’s value is distributed each year to support benefits. The legislation establishes that the payout rate increases by 2 percent every 15 years. At the end of 2013, the value of the benefit trust’s assets was more than $164 million. At present, funds from the trust cover about 90 percent of what agencies pay for active and retired employees’ health care, said agency treasurers. The changes to the Medicare Advantage plan come after a number of complaints from retirees, many of whom were promised full health benefits in their golden years when church agencies hired them. Joanne Adams, 66, worked for United Methodist Communications for 20 years, and her husband James Curtis Adams, 73, worked for the agency for 38 years. Before this year, she told United Methodist News Service, she and her husband typically would be on the hook for $20 or $50 co-pays and then Medicare and the agencies’ insurance program would take care of the rest. Her husband, when he retired in 2001, initially paid no premiums. But now, she said, the couple is paying more and getting less. “What I don’t understand is why for the elderly we are not getting a better plan because you know we are going to have expenses,” she said.